As the healthcare industry evolves, so can your career. Start by forming a clear strategy. At the George Washington University, our online Healthcare MBA draws insights from elite faculty leaders based in the nation’s capital. As a pioneer in the industry, this program is designed to help professionals expand upon decades of experience to hone a specialized expertise — and it has helped graduates succeed for more than 15 years. Here, you can customize your MBA and build your ideal curriculum online from courses that span our top-tier schools in business, medicine and health sciences, public health, nursing, international affairs or law. Focus your electives and simultaneously earn a graduate certificate that complements your MBA, including certificates in clinical research, health sciences, regulatory affairs and more. You can also take advantage of unique study abroad opportunities. It all adds up to a personalized approach that is a prominent reason why our Healthcare MBA attracts a diverse range of professionals, including seasoned healthcare experts, varied business leaders, and international and military students. Join us, and develop skills to support progress in the healthcare industry — and your career. The George Washington University is ranked in the top 100 among Best National Universities by U.S. News & World Report. 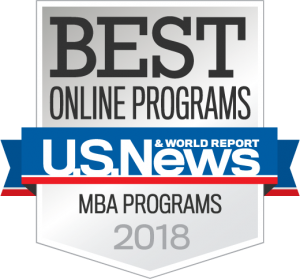 The George Washington University School of Business has also been ranked in the top 25 as a Best Business School and in the top 40 as a Best Online MBA Program and is ranked #25 for Best Colleges for Veterans in 2019 by U.S. News & World Report. For nine years in a row, the George Washington University has been distinguished as “Military Friendly” by G.I. Jobs and “Best for Vets” by Military Times Edge. We’re also a proud participant in the Yellow Ribbon Program. The George Washington University School of Business is accredited by the Association to Advance Collegiate Schools of Business (AACSB International). AACSB ensures that quality management education is maintained around the world through a rigorous accreditation process. Located in Washington, D.C., the George Washington University is accredited by the Middle States Commission on Higher Education (MSCHE). The commission examines institutions to determine that educational programs maintain and promote the highest standards as part of the accreditation process. Our graduates form a diverse, expert network of doctors, executives, health administrators, nurses, pharmacists and other professionals dedicated to improving healthcare management. Experience ranges from less than five years to more than 25 years in their fields, yet the majority agreed: the GW online Healthcare MBA expanded their knowledge and helped them advance in the business and healthcare management industries. Which factors helped our graduates reach their goals? Where do they work today? Find out by exploring the results of our graduate survey now. Earn the premier degree of its kind 100% online. Our Healthcare MBA has helped advance business leaders for more than 15 years. 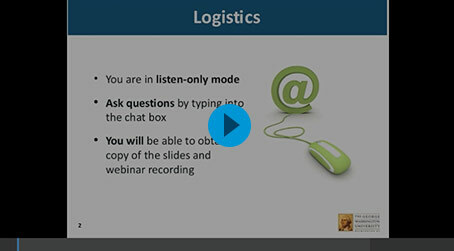 It’s designed to be flexible and provide convenient course options that work with your busy schedule. Build your personalized curriculum from an array of robust options. Choose electives from our distinguished schools in business, health sciences, public health, law and more. Your elective courses can also serve to add a graduate certificate to your MBA. Join a diverse network of professionals, including health directors, doctors, nurses, consultants and more. The majority of our graduates report more than 10 years of health industry experience. Your online MBA also provides study abroad opportunities. Earn a distinguished online Healthcare MBA from one of the best business schools in the nation, as consistently ranked by Businessweek, The Wall Street Journal and Forbes. It’s also a top option for active military members and veterans. Why Choose GW’sONLINE Healthcare MBA? affairs or clinical research are among some of those options that position you to graduate with a distinguished MBA and a unique specialty showcasing your refined experience. 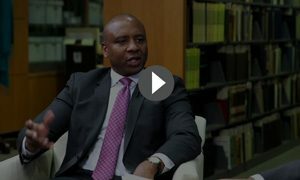 An associate teaching professor from the School of Business, the senior associate dean for Health Sciences and the chair of the Department of Clinical Research and Leadership from the School of Medicine and Health Sciences explain the partnership, the program curriculum and opportunities for students. 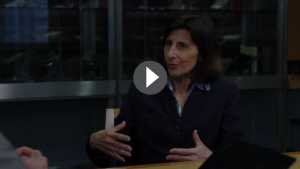 Hear Lisa Brancheau, assistant director of Global and Experiential Education at GWSB, talk about the unique opportunities for students to add a global perspective to their degree. 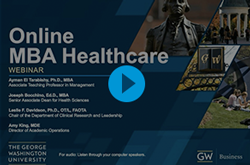 The GW online Healthcare MBA is more than a traditional, theoretically-based curriculum; it prides itself on being a practical program that emphasizes the applicability of business methodologies and practices to healthcare environments. Students are able to exercise the tools of business management, decision-making and leadership in their current and future healthcare roles, while also bringing their own real-world situations into the classroom. The George Washington University online Healthcare MBA degree program is taught by a faculty of acclaimed scholars, practitioners and educators. Students in the program benefit from the exceptional research and published works of this group of business and healthcare experts, which creates a rich and challenging environment for high-level dialogue and instruction. The esteemed program faculty also brings an abundance of practical healthcare and business experience into the classroom. Who Should ChooseA Healthcare MBA? The online Healthcare MBA attracts professionals seeking to acquire solid business skills with a clear health focus. The objective? To help you develop a specialized expertise to pursue leadership roles, including health services manager, administrator and executive. Your background in healthcare makes you particularly well-suited to pursue the online Healthcare MBA at the George Washington University. Whether you are a practicing physician, administrator, pharmacist or pharmaceutical executive, business professional, nurse, healthcare director or manager, scientist, dentist or dental hygienist, this program offers options to customize your Healthcare MBA and align it with your career goals. Professionals with strong business backgrounds in areas such as health insurance or the regulatory and consulting industries can seek opportunities in the expanding healthcare market, where a range of skills can lead you down alternate career paths. The online Healthcare MBA can help diversify your expertise to acquire key insights into global regulations, the clinical research industry, trends that affect today’s health systems and more. Learn more about Genevieve here. Learn more about Chris here. Medical professionals — nurses, doctors, dentists and others — who wish to develop business skills to improve patient care or transition to a leadership role can leverage the online Healthcare MBA to do this more effectively. Your Healthcare MBA includes core business courses in strategic decision-making in a changing environment, managing people and organizations, managing information resources and other foundational business concepts. It also offers options to take elective courses at the School of Medicine & Health Sciences and gain expanded insights into specialized areas such as the clinical research industry, clinical investigation, healthcare enterprise and more. Learn more about Talal here. 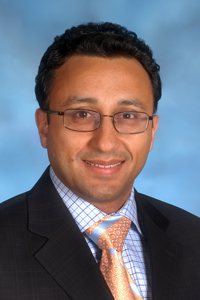 Hassan Mirza, JD, MBA, Ph.D. Learn more about Hassan here. Learn more about Kimberly here. Both business and medical professionals can gain skills through the online Healthcare MBA to help you succeed as an entrepreneur. Whether that’s running a private practice, consulting firm or other healthcare business, your career goals can align with our robust MBA course options. Pursue the precise skills you need to support your unique priorities as an entrepreneur with specialized graduate certificates and your choice of elective courses in business, medicine and health sciences, public health, nursing, international affairs or law. Listen to Professor Ayman El Tarabishy, associate professor of management and executive director for the International Council for Small Business (ICSB), GW School of Business, talk about the future of entrepreneurship in healthcare. Learn more about the dance of entrepreneurship, corporate entrepreneurship and social entrepreneurship in healthcare.